All You Need is Love: I Survived!! I made it too 100! Woo Hoo!!! Just the fact that I survived today and was able to post this is an accomplishment in itself. Today was GG's friend party. 8 kids at an ice skating rink. I must admit, I was scared shitless a little nervous about the whole thing. But it went over very well. The kids had an hour to skate, then it was time to eat lunch and cake, and open presents. They had about a half hour at the end to skate some more. The only thing I didn't like was that you have to pay for at least 10 kids, even if 5 show. But for what you get for your money, it's really not that bad. I got the more expensive package. All the kids and 2 adult chaperones got free skate rental, food was provided for the kids (hot dog, plain or peperoni pizza, hamburger or cheeseburger), 2 pitchers of pop, cake, t-shirt for the birthday girl, and a coupon for a free admission for a later date. Not too bad for $14 a kid, which is what I payed for the party last year and didn't get nearly as much stuff. And the cake was awesome, too!!! Now the only thing we have to do is put all the presents away, but that can wait for tomorrow. We're all tired and my head ache is just sucking the life out of me. So, back to my big accomplishment. I started this blog for friends and family who I don't see too often. It was a way to keep them updated on everything going on with the 4 of us. Then I started reading other blogs, participating is different games. I've learned that while my blog is still a way for me to update those who we don't see too often, it has become more for me than anyone else. It's a place for me to vent, be creative, have fun, and sometimes brag about my kids. I admit I love comments. And whether you're a follower or just someone passing by, I thank you for taking the time to read my ramblings. And if you want something from me to show off on your blog, you can snag this pic that I found. You don't have to take it. You could just be happy that you have given me the motivation to keep on truckin' through the blog world and know I am very appreciative. Isn't it amazing how much fun it is to blog? There are just so many wonderful people out here and it's so fun to read everything! I'm glad you keep truckin' on! And that party sounds great! Yeah for making it to 100 and a party too. 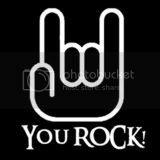 You rock..
Congratulations on your 100th post! So sorry that I missed it...I'm trying to get caught up on posts! Love reading your blog and I so agree that blogging is awesome!